Afzali, D., Biniaz, Z., Mostafavi, A. (2011). Application of Modified Nanoclay Sorbent for Separation and Preconcentration Trace Amount of Cobalt. International Journal of Nanoscience and Nanotechnology, 7(1), 21-27. D. Afzali; Z. Biniaz; A. Mostafavi. "Application of Modified Nanoclay Sorbent for Separation and Preconcentration Trace Amount of Cobalt". 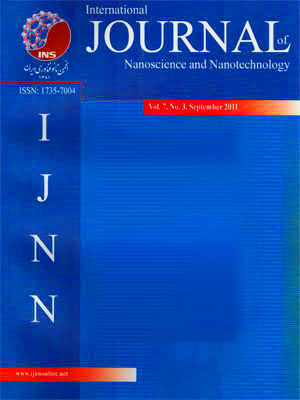 International Journal of Nanoscience and Nanotechnology, 7, 1, 2011, 21-27. Afzali, D., Biniaz, Z., Mostafavi, A. (2011). 'Application of Modified Nanoclay Sorbent for Separation and Preconcentration Trace Amount of Cobalt', International Journal of Nanoscience and Nanotechnology, 7(1), pp. 21-27. Afzali, D., Biniaz, Z., Mostafavi, A. Application of Modified Nanoclay Sorbent for Separation and Preconcentration Trace Amount of Cobalt. International Journal of Nanoscience and Nanotechnology, 2011; 7(1): 21-27. The present article reports on the application of modified organo nanoclay as a green, easily prepared and stable solid sorbent for the preconcentration of trace cobalt ion in aqueous solution. The organo nanoclay was modified by adsorption of 5-(4-dimethyl amino-benzylidene) rhodanin reagent onto it. The sorption of Co2+ ions was quantitative in the pH range of 7.0 to 8.5, whereas quantitative desorption occurs instantaneously in 5.0 mL of 2.0 mol L-1 HNO3. The eluted solution was aspirated directly into the flame of atomic absorption spectrometry (FAAS). Linear range for determination of cobalt was maintained between 0.176 ng mL-1 to 15.0 μg mL-1 in initial solution. Relative standard deviation for ten replicated determination of 1.0 μg mL-1 of cobalt was ±2.34% . Detection limit was 0.1 ng mL-1 in initial solution (3Sbl, n=10) and preconcentration factor was 170. The sorption capacity of modified nanoclay for Co (II) was evaluated 0.56 mg per g of sorbent. The effects of the experimental parameters, including the sample pH, flow rates of sample and eluent solution, eluent type, breakthrough volume and interference ions were studied for preconcentration of Co2+. The proposed method was applied for determination of cobalt in water samples.